Mrs. ReaderPants: Book Fair Tip #6--Know the location of every item in the take-home flyer. Book Fair Tip #6--Know the location of every item in the take-home flyer. Again, I am going by Scholastic book fairs on this one. Other book fairs may or may not provide book fair flyers; I have only used Scholastic. If your fair does not provide a take-home flyer, you might consider making one to highlight some of your favorite book fair offerings. "My son asked me to get him some snake book from the book fair. It was in the flyer. Can you help me find it?" 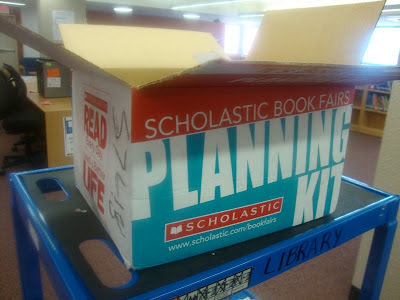 Approximately six weeks before the Scholastic book fair, the "book fair chairperson" will receive a large box with book fair promotional materials. Included in this book fair set up kit are beautiful flyers that showcase some of the book fair items. Scholastic provides these flyers based on the school enrollment as listed in your chairperson profile on their website. That said, I almost always have to request additional flyers. These full-color flyers are designed to SELL. Scholastic usually sends additional quantities of the items listed in the flyer because you will need them. Record item locations on a couple of flyers. "I wanted to get that book with the wolf on the cover. It was blue, with big wolf eyes. It was in the flyer. You know what I'm talking about, right?" Students, teachers, and parents will ask the location of books in the flyer, and some students will need to look at a flyer to remember which book they wanted. As you set-up your fair, go through the fair and locate all the items that are on two or three take-home flyers. I learned the hard way that one is not enough (it went missing, then we had to do it again!). 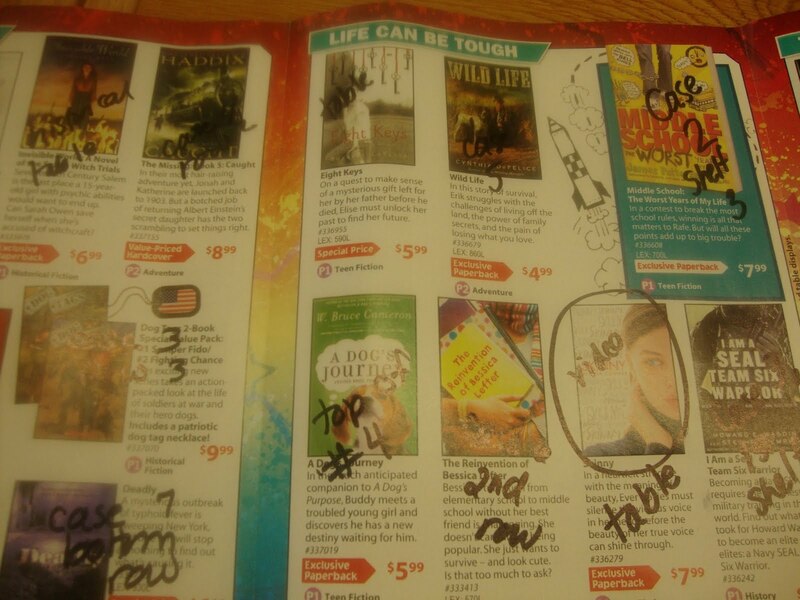 Use a sharpie to write the case or table number for each item on a couple of flyers. Keep the flyers by the register for quick reference when a student or parent is looking for a specific item. As you record the location of each item, take a minute to check your stock levels. 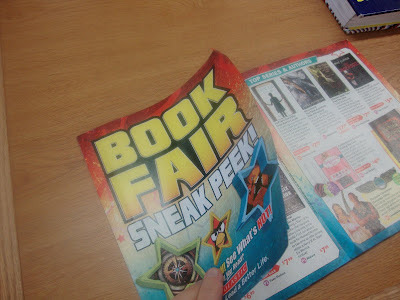 The items in the flyer tend to be very popular, and Scholastic does allow librarians to place restock orders just prior to your fair. Why do you say abolish preview day? Are you talking about preview for teachers or for students? Thanks! @Jackie Johnson--If you click on the "Abolish Preview Day" tip above, it will link to my post about it. Basically, I think having a student preview day is a waste of a book fair day. Students should be able to purchase or preview whenever their class comes for the fair. I have never done a teacher preview--they usually just come in to look with their students. For most of my elementary library days, I was on a flex schedule, so the teachers were in there with their classes anyway. I have no opinion on teacher previews--do what works for you. Hi Mrs. ReaderPants- I am moving back to an elementary school after being in a middle school and I am looking forward to holding my book fair in September. I am wondering if you have any advice about Parent volunteers during the book fair? The school I am moving to has a very active PTO. @m.otoole--Parent volunteers? Absolutely! For me, parent volunteers are indispensable. If you give them ownership of the library (or at least a section of the library), many of them will run with it. I got very close with my volunteers in my time in elementary and still keep up with several of them four years later. Stay tuned! Your question has decided my next book fair post--#7 will be about using parent volunteers. Oh GREAT! Can't wait to read it. 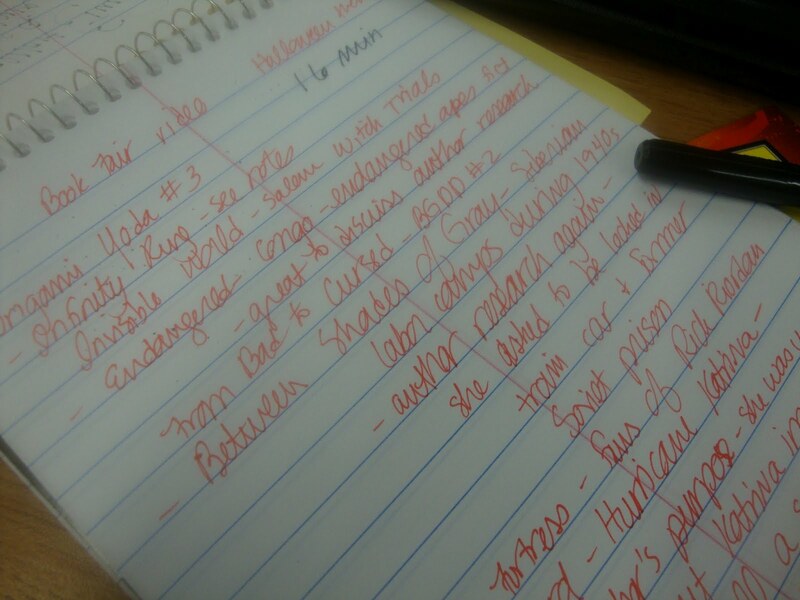 Love all the tips so far and will be using them at my book fair in September! I always have 4 to 5 volunteers for the k and 1st graders for the first book fair. The students are so helpless. I usually laminate several flyers so they are more sturdy and don't get thrown out. Great idea to mark where the items are located.